BLANCO®, the German manufacturer of finely crafted sinks and faucets will launch the new Truffle SILGRANIT II™ sink collection in April. The collection will feature 22 sinks in four stunning styles and seven trendsetting colors, making it easy to coordinate into almost any kitchen design. SILGRANIT II™ sinks are made from 80 percent granite and 20 percent acrylic resin, making them stronger and more water repellent than granite. 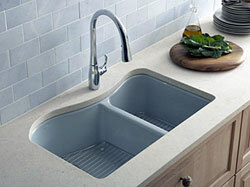 BLANCO® touts it's the only sink that has the strength of stone, yet the smoothness of silk. Shown in taupe, this exciting new color works with warm and cool color tones in the kitchen and brings out the natural beauty of stone countertops. 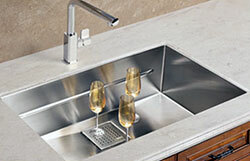 For a sleek, contemporary look you'll want to check out Ukinox's® new Micro Series undermount sinks. Crafted from durable 18-gauge stainless steel, these units feature slightly curved corners which allow for easier cleaning while still maintaining a crisp look. 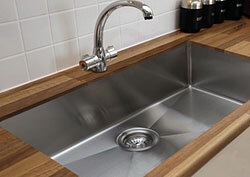 The hand-fabricated sinks measure 10” deep and include basket strainers, mounting hardware and a countertop template for easy installation. Bring an element of stylish simplicity and functionality into your kitchen design with Elkay's® new Gourmet™ sinks and faucets. The Gourmet Collection™ features more than 300 unique styles including the new Aqua Divide™ double bowl sink models with a lowered partition to make it easy for you to wash pots and pans. Whether your kitchen is large or small, Franke's® new Peak Series of sinks offer a wide range of styles to meet your budget and taste. Each sink is hand-fabricated and designed to match with their faucets and range hoods so creating a cohesive look is easy. Try some cool accessories like a stainless steel colander and cutting board, which allow you to easily multi-task. 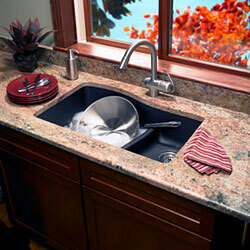 Make a bold design statement with a gorgeous granite sink by Swanstone®. It's made with 80 percent quartz stone for long-lasting durability and beauty. Because they are stain and impact resistant they make a great choice for a busy kitchen. They are available as a drop-in or undermount in four custom colors — bianca, granito, nero or espresso — which match most countertops. 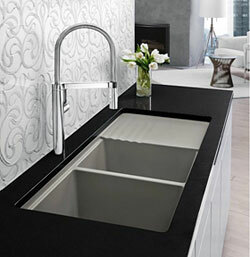 Cosentino® now offers an integrated quartz sink with its new Silestone® Integrity Sink™. It's made from one piece of Silestone® to integrate perfectly with your countertop and create a flawless kitchen design. It's available in 21 colors and features all the benefits of Silestone®, including scratch, stain and heat resistance. 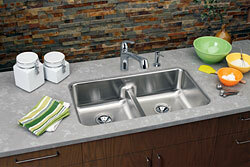 Add some pizzazz to your kitchen with a Linkasink® farmhouse sink. It's crafted from hand-hammered copper and then finished in satin nickel. 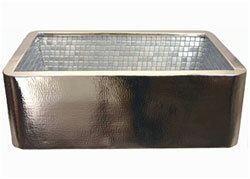 Stainless-steel tile mosaic gives this sink a luxurious sparkle and high durability. This functional work-of-art is definitely worth its high price tag if you can afford it. 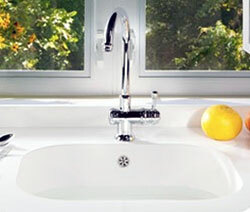 Kohler's® Lawnfield™ Sink features a clean, versatile design to complement a wide range of kitchen styles. The narrow saddle and elegant, wave-like curve create a distinctive look while minimizing splashing and water runoff. The generous 9" cast iron basin provides extra room to soak and wash oversized items and the curve provides the extra room to accommodate odd shaped kitchen gadgets.